On the closing day of San Francisco Pride, a day full of a grand parade through the streets of San Francisco one of the most brilliant films of the Frameline LGBT Film Festival, Derek screened to an audience at the Castro Theater. The artistic director of the festival Michael Lumpkin had wanted to show one of Jarman's films, which were impossible to find in a 35mm print in the USA. 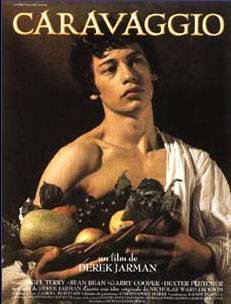 That is something to take note of since Derek Jarman and his films reminds us of a time in British filmmaking that no longer exists, a combination of the political, the artistic and, with a focus on gay sexuality in several complex films such as Sebastiane (1976) and Caravaggio (1986). Jarman served as production designer for Ken Russel's fascinating treatise on sexuality and the repressed clergy - The Devils. (1970). And without Jarman, Tilda Swinton said her industry career would never have taken off. She was asked to deliver a lecture on Jarman, a lecture that turned into a documentary film that she produced and wrote and which was beautifully directed by Isaac Julien. Swinton is featured in the documentary, staring at times straight into the camera as she did in Sally Potter's Orlando. "Here I am, and this is what I believe. So what do you think? Her and Julien's appearance in the film personalizes it and is never out of place. It allows for the material to update, and for the memorial to take place. And when we look at the images, we do miss Derek Jarman. Jarman was productive at a time before Margaret Thatcher and while the lucrative funding the British Film Institute gave to artists to develop their own voice in cinema was intact. Looking at some of his work it is with melancholy that one notes that this kind of film is not being made, this kind of film is not screened at Frameline, for after all Frameline simply culls from what is out there and is a showcase of the latest in LGBT cinema. Jarman marched in gay parades, just as we did today and when diagnosed with HIV gave a voice to his illness. Recall the years when Pride parades were virtually non existent in the 80's. His last film Blue with a voice over on his illness set to a blue screen was made just before he died in 1994. Derek is an outstanding collage of the work of Jarman, his films, music videos, and a lengthy interview with Colin McCabe in 1990 at his home Prospect Cottage in Dungeness which serves as a voice over to his images. His artistic sensibility is so incredibly rich and dynamic that it is impossible to not be inspired by his work and appreciate his contributions to cinema, art and set design. Swinton and Julien's homage hits home. 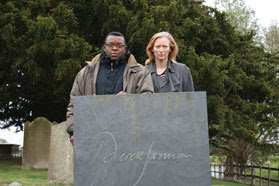 I was very much inspired to be a filmmaker by both Derek Jarman and Isaac Julien. You are right films like his are no longer funded. But please note Derek Jarman received funding later in his career than earlier where he was largely ignored. I discovered him when his wonderful film Sebastiane was shown on Channel 4 Television in the 80's. In the days when it showed challenging work. I mean work which made the brain work, as the film was in Latin. As for the availability of his work. It is also not readily available in the UK either. It shows us that we have to be mindful of who owns our work after we die I suppose. Xena: Warrior Princess, The Final Episode: A Friend in Need, Part I and II. Maria Schneider: Forget Last Tango. Vivre Sa Vie: Living "the life"
©Moira Sullivan. All Rights Reserved.. Picture Window theme. Powered by Blogger.